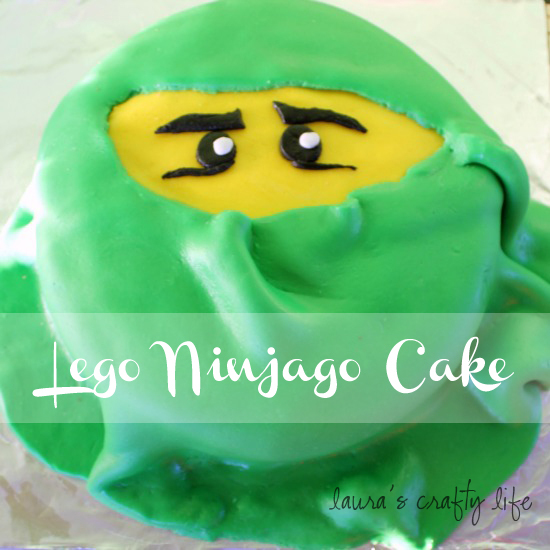 This is the last post for my son’s Ninjago party before I do a total party wrap up showing how all the details came together. 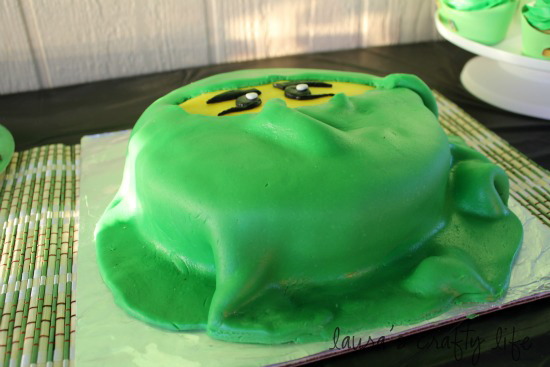 I found inspiration for the cake I wanted to make at Pint Sized Baker. 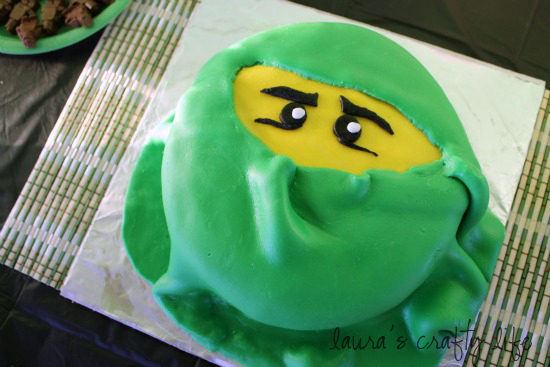 This cake was perfect because it wasn’t huge and it already had the green Ninja colors! I have made one other cake using fondant when I created a face for the Thomas the Train cake I made several years ago. 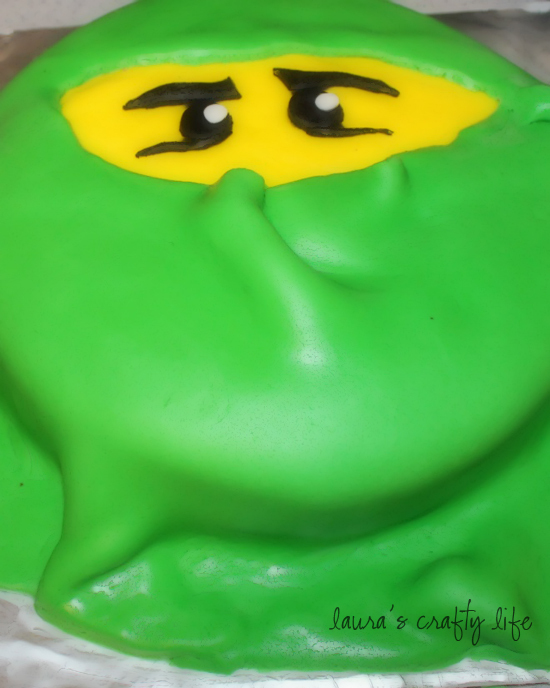 I have always been a little intimated by fondant, but it really isn’t too hard to work with. The two hardest parts were kneading the fondant and moving it once it is rolled out. For my first attempt at a full fondant cake, I think this one turned out pretty cute! I covered the entire cake in a thin layer of buttercream. I then rolled out a layer of yellow fondant to create the ‘eyes’. I cut out the shape using a sharp knife. I rolled out some black fondant to create the details of the eyes and again cut those out using a sharp knife. I applied them to the yellow piece. I rolled out tiny pieces of white for the center of the eyes. 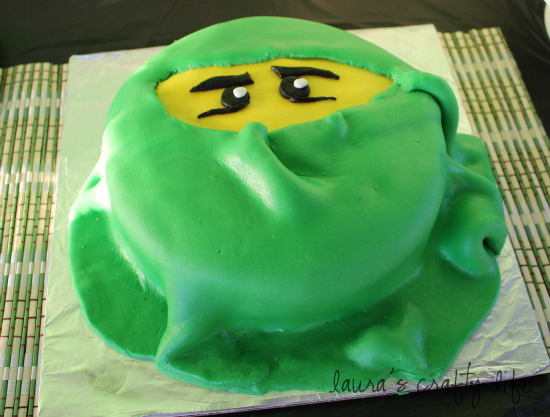 I put the yellow piece with the eye details onto the cake towards the top. I then rolled out all of the green fondant. I eyeballed the opening for how big the eye space needed to be. I rolled up the green fondant onto my rolling pin and transferred it to the cake. The great part about this cake was it didn’t have to be completely smooth. I was able to have some wrinkles around the base to look like his mask. Have you ever used fondant before? Any tips for me? It turned out really cute! I’m sure your son LOVED it! What fun memories. The only tip I can share, is that I cut my green mask into two parts. I had a top part and a bottom part. And when you are working with a large piece of fondant, roll the fondant up around your rolling pin to move it over your cake. I loved my Wilton cake decorating class at Michael’s! They are a lot of fun! I’ve never used it but always think I want to try. This one came out great! It totally looks like a ninja hood (or whatever ninjas call that).